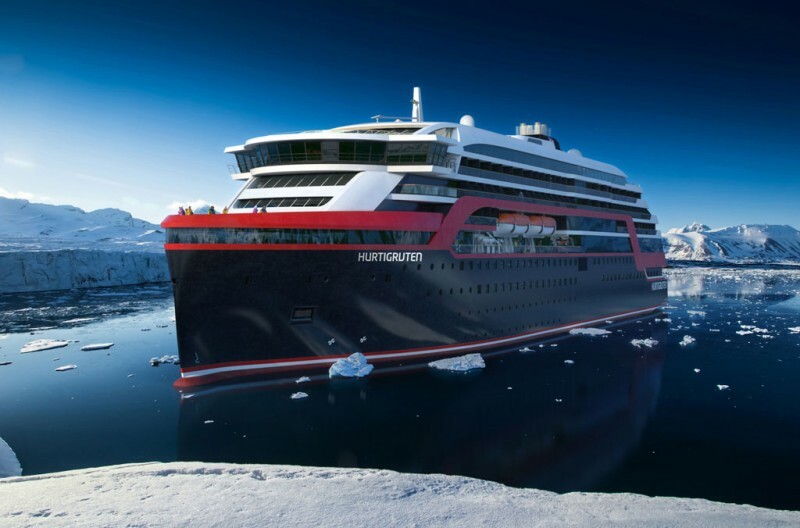 Two expedition ships being built for Hurtigruten will bear the names of Norway’s most influential Polar pioneers – Roald Amundsen and Fridtjof Nansen. The vessels, with a striking design created by Rolls-Royce in collaboration with Norwegian yacht designer Espen Øino, are scheduled for delivery in 2018 and 2019. A second pair is expected to follow later. 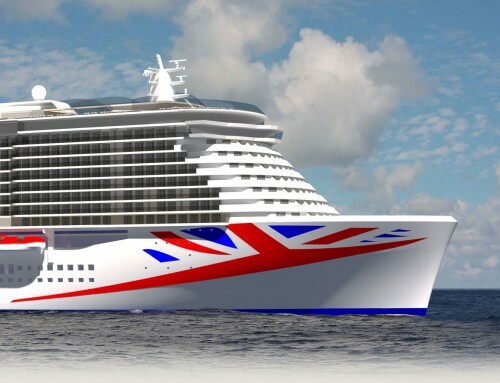 Driven by hybrid technology with the option for short periods of fully battery-powered propulsion, the ships will have ice-strengthened hulls and are designed to carry 530 passengers. 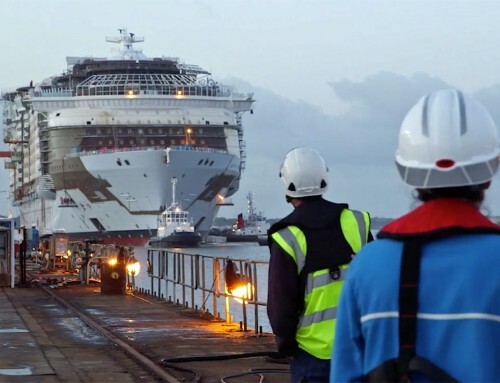 Most of the 265 cabins will have their own balconies. 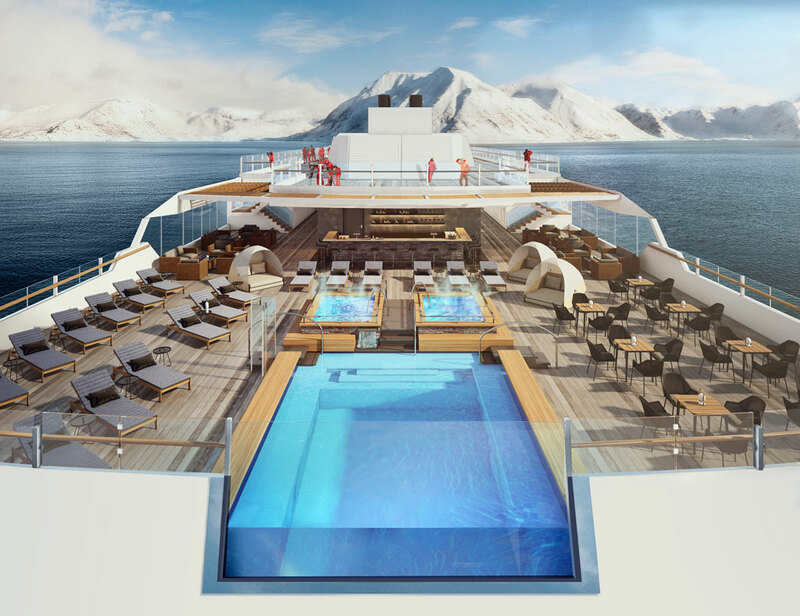 Large observation platforms will be a feature on several decks and there’s an infinity pool and Jacuzzis. The décor will be cool Scandinavian style featuring oak, birch, granite and wool. Their three restaurants will serve menus inspired by local flavours. Hurtigruten CEO Daniel Skjeldam said this week: “It is exactly 105 years since Roald Amundsen became the first person to plant his flag on the South Pole; 128 years since Fridtjof Nansen skied across Greenland; and 120 years since Richard With, Hurtigruten’s founder, first started exploration tourism in the Arctic. Hurtigruten has operated ships on the original Norwegian coastal route since 1893. The company brings goods, local passengers and tourists to 34 ports between Bergen and Kirkenes every day of the year. In the Arctic, Hurtigruten now offers voyages to Greenland; to Iceland; around Spitsbergen; and from 2017 to Arctic Canada. 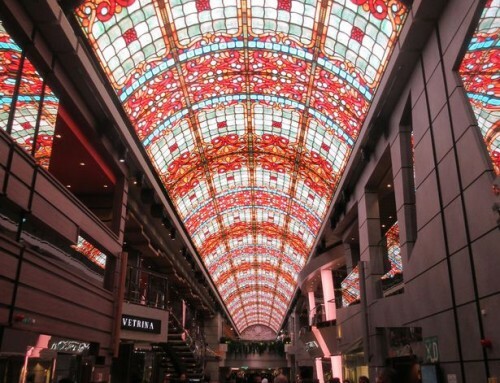 In the southern hemisphere, Hurtigruten takes guests to the waters around Antarctica; along both coasts of South America; and from 2017, to the Amazon rainforest. The expedition ships can be adapted for service on the Norwegian coast.